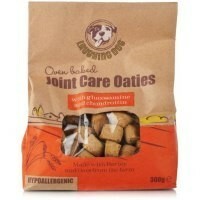 Laughing Dog Joint Care Oaties Dog Treats are a tasty hypoallergenic dog treat that is designed to help improve joint health. Containing glucosamine and chondroitin, these delicious treats aim to improve joint health and are free from wheat gluten, artificial colours and preservstives. The crunchy treats also help prevent the build up of tartar and plaque. These are brilliant snacks for teeth-cleaning. A nice added benefit to an after-dinner treat for my terrier. Will be trying more from Laughing Dog, definitely.